The final Sun Valley Ice Show of the season at Sun Valley Resort will feature world bronze medalist and three-time U.S. gold medalist Johnny Weir. 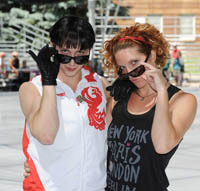 Weir and the full cast of Sun Valley skaters will perform on the ice next to Sun Valley Lodge at 8:45 p.m. Saturday, Aug. 31. Doors will open at 7:30 p.m.
Tickets range in price from $19 to $99. To purchase tickets, go to http://www.ticketfly.com/purchase/event/281153.